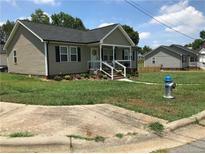 Find Shelby, NC Homes for sale. View Photos, Maps and MLS Data Now! Has city services but Duke Electric and county water. MLS#3497847. Carolina State Realty. Rollingwood - Priced well for a NEW CONSTRUCTION HOME. MLS#3497618. N C Land and Lots. Did I mention roof was replaced three years ago? MLS#3497726. Buddy Harper Team Realty. Rec room, family room with wet bar and media room have plenty of space for entertaining friends. MLS#3494962. Carolina State Realty. Lower level double garage with storage. MLS#3497192. RE/MAX Foothills Living. Spring Forest - This 4 bedroom is home waiting for you! MLS#3496574. Mark Spain Real Estate. Home has a nice covered front porch. MLS#3495412. RE/MAX Select. Two bedrooms, two baths. Appliances remain. MLS#3495853. RE/MAX Foothills Living. Homestead - Partially fenced back yard. New deck and covered area. MLS#3495799. RE/MAX Foothills Living. Updated Transitional Split Floor Plan home Features: 9 Foot Ceilings, Tile in Separate Laundry Room, Granite Kitchen and Baths, Custom Kitchen Cabinets, Kitchen Pantry, Stainless Appliances, Side Load Double Car Garage, Hardwood and Tile Throughout, Large 12 x 24 Rear Deck, Non Vented Gas Log Fireplace in Open Great Room, Huge Master Suite with Dual Walk in Closets, Dual Vanities, Private Water Closet, Walk in Shower, Large Garden Tub and Covered Rocking Chair Front Porch. Crest School District. County Taxes. MLS#3495719. EXP REALTY LLC. This 3 bedroom, 1 1/2 bath home is priced to sell. Needs TLC. Corner Lot. MLS#3495408. RE/MAX Foothills Living. Asking less than tax value. Sold as-is. MLS#3494294. Clay & Associates Real Estate. The storage building in the back yard remains. MLS#3493861. RE/MAX Select. Stoneridge - Some back yard fencing plus a storage bldg. MLS#3493879. RE/MAX Foothills Living. Currently zoned general business but may be able to be changed back to residential. Please check with zoning office. MLS#3493639. Renaissance Realty & Estate Sales. Additional Features Are The New Roof Installed In 2015, large Walk In Attic For Storage, 22x11.5 Breezeway, Covered Front Porch, large Storage Shed And A 2 Car Carport With Plenty Of Driveway Parking MLS#3493518. RE/MAX Select. In Crest High district. Open floor plan. MLS#3493521. RE/MAX Select. There is a detached double carport with an attached storage room. MLS#3493284. RE/MAX Select. Detached storage building. Fenced back yard. MLS#3476679. RE/MAX Select. You don't want to miss it! MLS#3492745. Kristy W London. (No showings till an accepted written offer is in place) Please do not disturb tenant.) MLS#3489546. Renaissance Realty & Estate Sales. Bonus room 360 SF above garage gives multiple uses. MUST SEE! MLS#3491471. Coldwell Banker Mountain View. Hamilton Heights - It is a must-see, new enlarged deck 11 x 30 approximately, great for entertaining. MLS#3489488. Select Premium Properties Inc.
Clinestead - Large family room and also a living room. Bonus room upstairs. MLS#3490235. RE/MAX Foothills Living. These statistics are updated daily from the Carolina Multiple Listing Services, Inc. For further analysis or to obtain statistics not shown below please call Highgarden Real Estate at 704-980-9062 and speak with one of our real estate consultants.